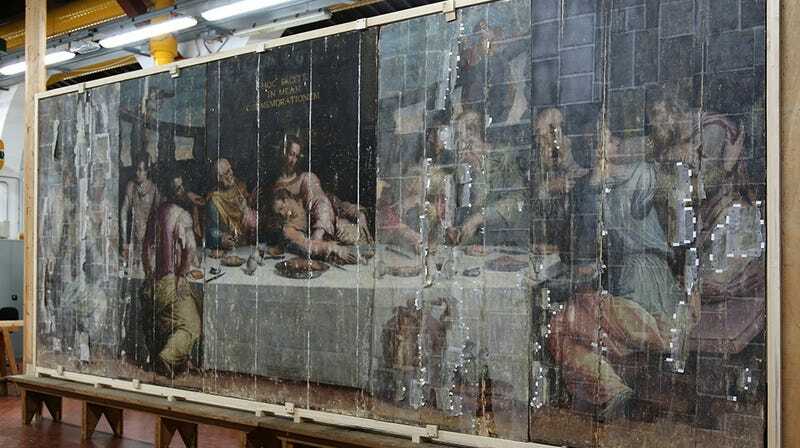 Giorgio Vasari's "Last Supper," catastrophically damaged by the 1966 flooding of the Arno River in Florence, has finally been pieced together again—with the help of glue made from sturgeons. That's right: fish. The Getty Foundation in Los Angeles funded the dirty work, which was so complex it had been put on hold for nearly half a century until the necessary art restoration techniques had been developed. These included the amazing array of materials and technical processes used by art restorers, who zero-in on extraordinarily specific parameters of a given piece of art: its thermal expansion, its reaction to humidity, even the barometric pressure in the room or display case, all of which give these objects the feel of biological specimens on display in a natural history museum. They are not dead artifacts, in other words, but living objects that perspire, swell, breathe, and react to sunlight. Whole new types of materials also need to be developed to pursue the task of object restoration. In the specific case of Vasari's "Last Supper," the individual panels of the painting—which had been separated after their flood damage—shrank differentially by as much as 3 centimeters, warping the overall painting and making it impossible to fit back together. As the Guardian explained last week, the painting's Humpty Dumpty-like condition was brought to an end by some rather low-tech means—such as pushing "tiny slivers of wood" into the gaps between panels—in addition to a weirdly unexpected example of biomimicry, like re-coating the surface of the painting with "a glue made from sturgeons brought to Florence by Russian experts after the flood." The back of the painting was then surgically stabilized using a series of "specially crafted" crossbars, similar to braces used in resetting a broken leg; one of these braces was actually made by Vasari himself to help hold the original painting in one piece. Images courtesy of the Getty.